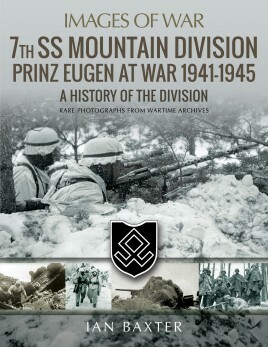 Drawing on a superb collection of rare and unpublished photographs the The 7th SS Volunteer Mountain Division Prinz Eugen 1941 - 1945 is the 7th book in the Waffen-SS Images of War Series written by Ian Baxter. Drawing on a superb collection of rare and unpublished photographs the The 7th SS Volunteer Mountain Division Prinz Eugen 1941 - 1945 is the 7th book in the Waffen-SS Images of War Series written by Ian Baxter. The book tells the story of the 7th SS Mountain Division was formed in 1941 from the Volksdeutsche (ethnic German) volunteers and conscripts from the Banat, Independent State of Croatia, Hungary and Romania. It fought a brutal counter insurgency campaign against communist-led Yugoslav Partisan resistance forces in the occupied Serbia and Montenegro. It was given the title Prinz Eugen after Prince Eugene of Savoy, an outstanding military leader of the Habsburg Empire who liberated the Banat and Belgrade from the Ottoman Empire in the Austro Turkish War. It was initially named the SS-Freiwilligen-Division Prinz Eugen (SS-Volunteer Division Prinz Eugen). Ian Baxter is an avid collector of WW2 photographs. His previous books in this Series include Hitler’s Boy Soldiers, Nazi Concentration Camp Commandants and German Army on the Eastern Front – The Advance, German Army on the Eastern Front – The Retreat and Nazi Concentration Camp Commandants, The Crushing of Army Group (North) and the SS Waffen Division series including SS Leibstandarte Division and SS Totenkopf Division At War. He lives near Chelmsford, Essex.